All works in the exhibition are available for purchase from 10:30 on Saturday 27 October, either in-person, or by phoning the Gallery at 0161 835 2666. This is Michael’s first solo exhibition at Contemporary Six, so a rare opportunity to see more than 30 of his works in one place. 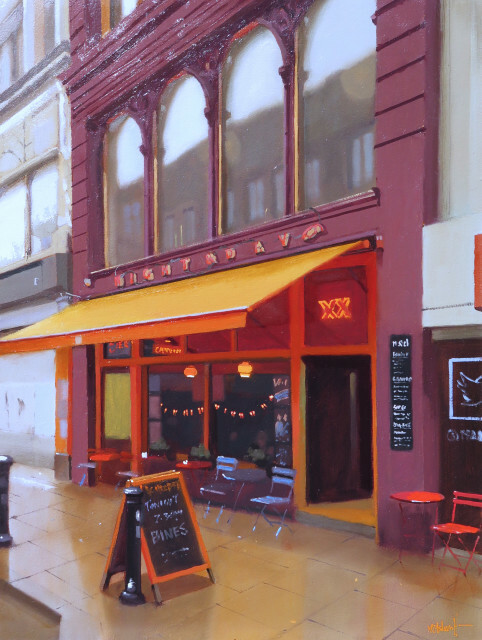 Works from three of Michael Ashcroft’s celebrated Manchester series of paintings will be on show together for the first time - After the Rain, Painting My Favourite Pubs and Manchester From Afar. Paintings starting at £800, all works on show are available for sale; there will also be a range of framed ink concept drawings for £250, which depicts the starting vision of a painting in process. Due to the incredible demand for Michael's Manchester art work, paintings will be available to purchase prior to the show, when they go live on the website. A master of landscape and cityscape in oils, Michael’s truthful style has captured the heart of this city and its art-lovers. His familiar Northern scenes, such as wet roads at dusk, raddled pub facades, and landmarks in the afternoon sun, are painted to celebrate the bustling and beautiful nature of Manchester to residents and visitors alike. Michael’s works are realistic but painterly, boasting an expert’s grasp of composition and contrast, and a faithfulness to his subject. Many art lovers believe his works to be Hopperesque, and as Edward Hopper said himself of his own paintings, the ‘outward expression of the inner life of the artist’ and indeed Michael's paintings are filled with affection for a city deeply important to him. Contemporary Six owner Alex Reuben said: "I believe that Michael Ashcroft is one of the most important living painters in the North West. His popularity in the gallery is overwhelming and his renown outside of Manchester is growing quickly. We're most excited to be showing a collection of works and we know just how popular they will be." Born in 1969, Michael John Ashcroft grew up in the small village of Croston in the heart of Lancashire. After leaving school in 1985 he began his career as an engineer, painting and sketching only in his spare time. In 1998 he had a major operation to remove a brain tumour and decided from then that he would spend his time painting. Michael's paintings have evolved over the years — from early abstract acrylics to using oils for more representational works painted plein air (painting outdoors). In 2013, Michael took part in series two of the BBC show Show Me the Monet and became one of 30 artists to show their work at the Mall Galleries in London. The underpinning foundations of Michael Ashcroft’s paintings have remained the same as he works to investigate his fascination with light and dark, and how the interaction of the two states constructs the atmosphere of the living city and the sweeping landscape. Art Critic David Lee, who was a judge on Show Me the Monet, said of Michael's work, "There are no secrets in what he does. Being open and honest he tells you directly through his pictures where his interests lie. We don’t have to be told by experts the meaning of his work because they are self-evident — we can see them for ourselves. In his landscapes as well as his views of the city, he wi­llingly lays bare his pleasures and beliefs. You can’t ask more of any artist than this. He is a worthy heir of those in the great tradition of Lancashire painters." Michael is a member of the Manchester Academy of Fine Arts (which is referred to with MAFA after his name) and has exhibited in The Royal Institute of Oil Painters, Royal Society of British Artists, The Howard De Walden Exhibition, and The Royal Academy Summer Exhibition in London. Contemporary Six offers the Own Art scheme, allowing clients to purchase a piece of art over ten interest-free payments.